The April Showers C2C Graph can be used to make a large pot holder or wash cloth. This is the April edition of my 12 months of Corner to Corner Crochet. I will be releasing a new graph every month. Check out the other Monthly Graphs that have been released. Plus more C2C Graphs Here. January – Cup of Cocoa Graph, February – Heart Balloon Graph, March – Four Leaf Clover. The April Showers C2C Graph is designed to be easy for beginners trying out C2C crochet graphs or charts. In this post you will find the graph, written chart, and tips for how many bobbins to use and where you will use those bobbins of yarn. Want more Free Crochet Patterns? Check out some of my favorite design below! Of course Corner to Corner crochet is not the only way you can use the April Showers C2C Graph. You could make the graph using the bobble stitch method or with single crochet tapestry crochet. How to Read this pattern – Ex. R6: 3B, 2G, B = 3 Blue Squares, 2 Green Squares, 1 Blue Square. For this graph I used 3 blue bobbins, and 1 pink bobbin, 1 grey bobbin, 1 yellow bobbin, and 1 white bobbin. The I used one blue bobbin for each side of the umbrella. I used the third blue bobbin for a very small portion of the center blue area that is near the arch of yellow in the umbrella. I normally do not like to carry one yarn color under the other but since the grey is such a small amount I did carry the blue under the gray yarn to cut down on the ends to weave in. For the Yellow and white, I was not able to carry this yarn from one row to the next. You can easily omit the white and make all those squares blue if you do not want to have many ends to weave in. I just really liked the idea of having the white represent the rain. 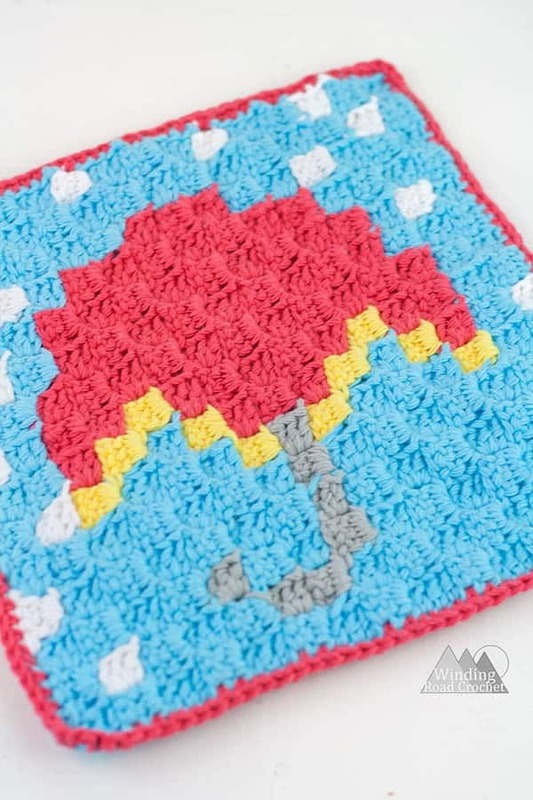 Are you going to make a April Showers C2C Graph Potholder? I would really like to see your finished piece, take a picture and share it with me on any social media! Just tag me @windingroadcrochet, #windingroadcrochet, or #ourcrochetjourney. Join my Facebook Group and share your creation with the community at Our Crochet Journey Facebook Group! Written pattern, tutorials, graphs and pdfs of the April Showers C2C Graph are copyright Windingroadcrochet.com. Please do not reprint or repost this content as your own, but please feel free to share this link with others. You can find more information on sharing my work with others in the Terms and Conditions Page.